North Dakota is in the throes of an oil bust after years of boom times that could be gone forever. Photo courtesy of AP Images. BISMARCK, N.D. — When lawmakers filed into the Capitol here in August, they were repeating a familiar scene. North Dakota was in the throes of an oil bust after a six-year drilling boom that transformed parts of the state. The price of oil had been in free fall, state revenue was down almost one-fourth and the state's primary savings account was almost empty. Now they had assembled for a three-day special session to decide the winners and losers. Would they cut the road budget? Schools? Nursing homes? It could have happened in any state capitol in the oil patch, in any of the downturns that have plagued the oil business since its inception. Has the U.S. seen its last oil boom? Energywire explores the issue in this five-part series. Click here to view the report. Just maybe, a few of the legislators were praying for the next oil boom, the way their fathers and grandfathers did. But this oil bust could be different. A growing body of research says that changes in the international oil market, rapid advances in wind- and solar-powered generation and regulations aimed at curbing climate change may hold down the price of oil and natural gas for years or even a decade. "We've actually hit a point that this isn't your daddy's kind of boom and bust — it's a new set of factors that are influencing demand," said Shanna Cleveland, a manager of the carbon asset risk program at the nonprofit group Ceres. A lot of people disagree with the idea. And even among those who agree, there are different ideas about how a long-term decline in oil demand could happen and, crucially, when it could happen. But if the predictions are accurate, it could mean that even though oil prices are recovering, they may not hit the $100-a-barrel peaks they reached just two summers ago. And it could extend the economic pain that's already rippling across a half-dozen states dependent on taxes on oil production, from Alaska to the Gulf of Mexico. In North Dakota, a handful of small towns took on hundreds of millions in debt to pay for schools, parks and other projects. A prolonged oil bust could send those communities into a downward spiral in which a dwindling population is forced to pay for boom-time debts with a shrinking tax base. Wyoming had to cut funding for drug treatment programs, at a time when more people need them because of the state's shrinking economy. And Alaska, which is more dependent on the energy sector than any other state, has cut its cherished annual "dividend" that each resident receives annually from the state. As oil booms go, the one that lasted from 2008 to 2014 was a doozy. Oil production in the United States had been dropping steadily for more than 25 years when a handful of companies began experimenting with horizontal drilling and hydraulic fracturing to see if they could do with oil what they'd done with natural gas. A lot of the same companies had already made a bundle fracking for natural gas, so much so that they had created a surplus and driven down the price. 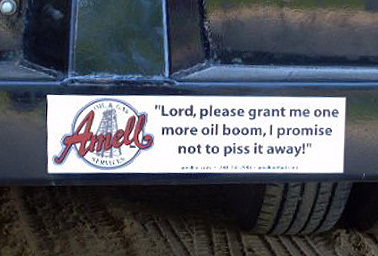 Oil-field bumper stickers are a common site in America's oil patches. Photo courtesy of Mark Amell via LinkedIn. Fracking for oil worked, too. Companies found huge reserves of crude trapped in rock beneath the old oil fields in Colorado, Louisiana, Mississippi, North Dakota, Oklahoma and Texas. U.S. oil production, which slid from 9.6 million barrels a day in 1971 to 5 million barrels a day in 2008, started to rise again. By 2014, the United States was producing 8.8 million barrels a day, and policymakers started talking about a 20-year oil boom that would be immune to price swings. 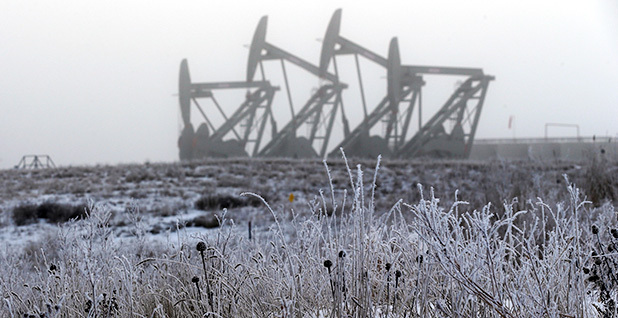 The boom upended North Dakota's slow-but-steady oil industry. The state pumped between 100,000 and 200,000 barrels a day from the 1980s to the early 2000s. But by the end of 2009, a dozen or more companies were fracking the Bakken Shale formation, and the state was pumping double that amount. By 2014, production had grown nearly tenfold. So many drilling crews poured into North Dakota that they were forced to live in hastily erected trailer parks known as "man camps." There were a lot of growing pains. The four most productive counties in the state covered an area larger than New Jersey. When the boom started, about three-fourths of the roads in the oil patch were unpaved gravel tracks designed for farm traffic (EnergyWire, Oct. 9, 2013). North Dakota has one of the highest taxes on oil production in the country, and the state coffers filled up with cash. The state Legislature doled out a couple of funding "surges" to the oil-producing counties to help pay for roads and other infrastructure. When state's output reached 1 million barrels a day in 2014, the North Dakota Petroleum Council threw a party in Tioga, where one of the first Bakken Shale wells was drilled. Republican Gov. Jack Dalrymple attended and 3,000 guests ate boiled crawfish and shrimp from the Gulf of Mexico, The Bismarck Tribune reported. By the fall of 2014, a string of decisions made half a world away had brought the party to a halt. Saudi Arabia, the world's biggest oil exporter, ratcheted up its production in September and October, pushing down prices around the world. Suddenly, there was more oil flowing around the world than was being consumed, and the price began to fall. To keep the price from falling further, someone needed to cut back on production, and all eyes turned to OPEC. But on Thanksgiving Day in 2014, the oil ministers from the 12 OPEC nations emerged from a meeting in Vienna and announced they couldn't reach a deal to control production. The price of West Texas Intermediate, the benchmark grade of crude for U.S. producers, fell below $70 a barrel the next day and kept falling through 2015. Almost two years later, oil companies and a lot of legislators in North Dakota still view the drop in prices as a blip. Folks in North Dakota are optimists — their grandparents in many cases were immigrants who stepped off a train and built communities on the frontier, said Vicky Steiner, a state representative and former executive director of the North Dakota Association of Oil Producing Counties. And they have faith in the determined oilmen who found oil in places that bigger companies had written off. Chief among them is Harold Hamm, CEO of Continental Resources Inc., the state's biggest oil producer. In January, when the price oil dropped below $30, Hamm predicted oil would nearly double by the end of the year (EnergyWire, Jan. 15). "I have a lot of confidence this is short term, and even if it's two or three years we can wait it out," Steiner said. "Harold Hamm says it'll $60 by December, and that's what I choose to believe today." Outside North Dakota, a lot of economists and policy watchers — not to mention a few oil executives — are starting to think differently. 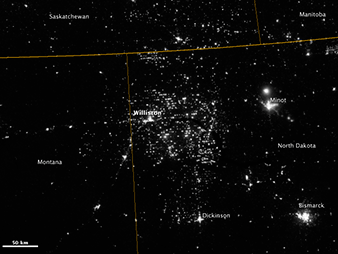 The Bakken Shale at its drilling height in 2012 as seen from space. Photo courtesy of NASA's Goddard Space Flight Center. Many of them see the Saudi decision as one of several interlocking trends that could change the international oil market. The theory, often dubbed "peak demand," is that new technology and new types of energy will replace oil and gas the same way they've replaced coal in some developed nations. First, a record amount of solar- and wind-powered generation has been installed around the world, and the cost of renewable power is falling so fast that those sources could soon be cheaper than coal or natural gas. As much as two-thirds of the new electric generating capacity around the world in the next 25 years — $7.8 trillion worth — will come from wind, solar and hydrodynamic power, Bloomberg New Energy Finance reported in June. At the same time, demand for electric cars and battery storage systems will rise as they become cheaper, which will also cut into demand for fossil fuels, BNEF reported. The head of China's state-run power grid, Liu Zhenya, told a conference of energy executives in February that his country sees renewable power sources as "a fundamental solution" (EnergyWire, Feb. 26). Meanwhile, the United States, China and other countries are looking for ways to cut their emissions from oil, gas and coal as they try to meet the commitments they made in last year's climate change talks in Paris (ClimateWire, Dec. 12, 2015). While it'll take years for those emissions cuts to affect demand for oil, they could create a "green paradox" in which low-cost producers like Saudi Arabia try to grab a bigger share of the market, at the expense of high-cost producers like those in North America, said Jim Krane, a fellow at Rice University's Baker Institute for Public Policy. The Saudis may have made their move already. In addition to ramping up production, Saudi Arabia's new oil minister announced in April that the kingdom would sell shares in its national oil company and would dedicate much of its oil revenue to a huge new sovereign wealth fund. Saudi Arabia's King Salman has said he wants to diversify the country's economy and move away from its reliance on oil production (EnergyWire, April 26). Cleveland, at Ceres, and other researchers see Saudi Arabia's big increase in production as another sign of the country's determination to move away from the oil economy. The country's leaders appear to have realized that the combination of renewable energy and climate change regulation could transform the oil business, and they are trying to "monetize" their oil reserves over the next few years. How the trend could play out is anyone's guess. Cleveland said there could be downward pressure on oil prices for the foreseeable future, although it's hard to predict how much. And there are numerous wild cards. A war in the Middle East could send oil prices back through the roof. The U.S. elections in November could lead the country to change its policy on climate change, too. The Republican nominee for president, Donald Trump, has called climate change a hoax, and oil companies are giving heavily to Republican congressional candidates (EnergyWire, Oct. 17). Mark Muro, who studies state and local government at the Brookings Institution, predicted it could take a while for the forces of peak demand to flatten out the oil industry's peaks and valleys. "The jig is probably not up in the next 10 years, but in the next 20 years," he said. "There's probably one more cycle." Jason Bordoff, a former White House adviser on energy policy who now runs the Center on Global Energy Policy at Columbia University, said the decline in demand could have a different effect. It could make oil prices more volatile, increasing the frequency of boom-and-bust cycles. The debate is beginning to pop up among energy companies, though. Scott Sheffield, the CEO of Pioneer Natural Resources Co., said at an energy conference last month that demand for oil could start to wane by 2025 (EnergyWire, Sept. 22). Appearing at the same conference, Rice University's Kenneth Medlock replied, "There is no peak in demand." The supermajor oil companies, who plan decades in advance because they rely on massive projects like offshore drilling, haven't changed their view. Exxon Mobil Corp., in its annual Energy Outlook, predicts that oil will remain the top fuel around the world with demand for oil and liquids rising 20 percent by 2040. Oil, gas and coal will still provide 80 percent of the world's energy in 2040, according to Exxon's outlook, despite the growth in renewables. BP makes much the same case in its annual outlook, predicting that fossil fuels will provide 60 percent of the new energy in the world, and 80 percent of the total energy, in 2035. The short-term impact on oil-dependent states was clear this spring, though, as legislators met around the country to work on their budgets for the 2016-17 fiscal year. 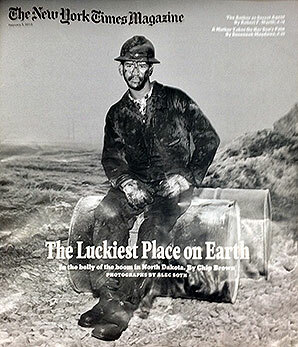 The boom in North Dakota was so immense that it became a cover story for The New York Times Magazine in 2013. Photo courtesy of Flickr. Louisiana's oil revenue hit its lowest point since 1999. That was one of the reasons that Gov. John Bel Edwards (D) was forced to call two special sessions of the Legislature to balance the budget with new taxes. Two years ago, Oklahoma opted to make permanent a tax break for horizontal oil and gas wells. This spring, lawmakers faced a $1.3 billion revenue shortfall, the largest in state history. In Alaska, oil production has been falling for years, so the drop in prices made a bad situation worse. Oil revenue came in at $1.2 billion, 90 percent below its peak in 2014. State legislators trimmed the 2016-2017 budget to $4.3 billion from about $6 billion the previous year but are still relying on a $3.1 billion transfer from the Constitutional Budget Reserve, one of the trust funds set up to invest the state's oil wealth. In North Dakota, which operates on a two-year budget cycle, Dalrymple's administration started the biennium predicting $5.6 billion in revenue. By this February, the prediction had dropped by $1 billion. By July, the shortfall had grown to a cumulative $1.3 billion and Dalrymple was forced to call a special session to cut spending and move the remaining funds from the state's reserve account. Meeting in early August, the lawmakers trimmed 2.5 percent from most state services, on top of a 4 percent cut approved in February. They transferred the remaining $75 million from the state's reserve account and pulled $100 million from the state-owned Bank of North Dakota. The state's public schools and human services agencies were spared from the latest spending cuts, but not from the decreases Dalrymple ordered in February. North Dakota still has billions of dollars locked up in other reserve funds, but legislators left Bismarck worried that they'll return to find another budget shortfall when they return in January. Muro, at the Brookings Institution, said a lot of oil-producing states may have missed a chance to diversify their economies when times were good. The best approach for oil-dependent states would be to sock away their oil taxes in trust funds, which would even out the boom-and-bust cycle, and invest for the long-term in education and infrastructure. Texas went through that sort of transformation after the oil bust of the 1980s and has emerged from the 2014 oil bust with fewer side effects, Muro said. But in other states, the fiscal crunch is so dire that they cannot afford to invest for the long term. "This is the perverse outcome of not having prepared," he said. "They will be going, at least in the near term, in the wrong direction." Reporters Margaret Kriz Hobson and Pamela King contributed.